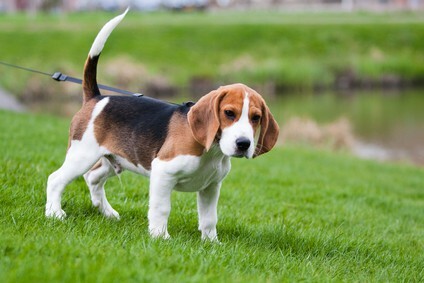 The Beagle temperament makes him very popular with dog owners the world over. This is because the Beagle is a very loyal and inquisitive breed. Breeders originally bred the Beagle to be a hunter. Because of this, the Beagle can sometimes display behavior uncommon to other dog breeds. This is why it is important that you understand the Beagle temperament. Once you know the dog's true nature and why he behaves the way he does, it is that much easier to work with him. To deal with the Beagle temperament, you must first show the dog that you are the boss, not him. Your Beagle is the same as all dogs when it comes to expecting a pack leader to guide him on what to do and when, and that someone needs to be you. Whenever possible, show your dog that you are in charge and in command. Simple acts like allowing him to sleep in your bed can set a bad precedent. If you want him to be able to spend the night with you in your room, get him a dog bed. His bed should be lower than yours. Here are some Beagle temperament traits and behavior quirks you might encounter in your dog, as well as tips for how to address them. Another potentially undesirable trait of the Beagle temperament is barking. To stop your Beagle from barking, you should first find out why the dog is barking in the first place. Barking is a form of communication, so you should find out what the dog is trying to tell you. Beagles have a lot of energy, and they sometimes bark when they feel the need to spend time outdoors. 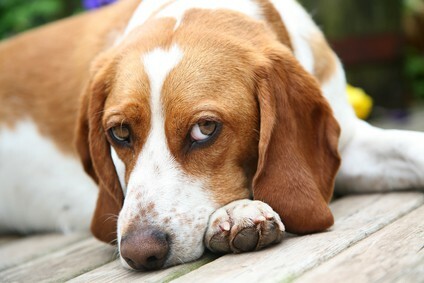 Never scold your Beagle harshly, but you also need to let him know when his behavior is unacceptable or inappropriate. You should never throw objects at the dog to stop him from barking. A firm, commanding “No!” should be enough, followed by praise for obeying you. While you may be able to tune out your dog’s barking, your neighbors may not be able to, which is why you should minimize how often he does it. You should train your dog to bark only when he believes there is a potential threat to his home or family. Despite the cute and cuddly looks of these lovable animals, Beagles can sometimes be aggressive. Beagles are aggressive dogs by nature, but nonetheless, you should learn how to deal with aggression just in case. You should never act aggressively towards your dog. Shouting at him is also a no-no because you will only aggravate his aggression. Neutering your Beagle might help alleviate some of his aggression by reducing his level of testosterone, a hormone that fuels aggressive behavior in dogs. If his aggression is excessive, you can consult a vet to find out if your dog has any medical ailments and what to do about it. You can also contact a professional dog trainer for additional assistance. Another very common Beagle personality trait is that they crave companionship and can become stressed and anxious if left alone for too long. As a side note, you should learn about dog separation anxiety so you do not confuse the symptoms with plain old boredom. Beagles tend to be destructive and mischievous when bored. They might end up chewing your favorite belongings or digging in places where they shouldn’t, like in your garden. To deal with these issues, it is important to keep your canine friend preoccupied as often as possible. 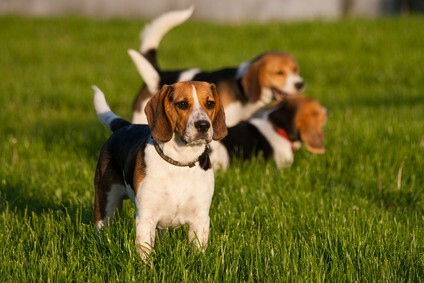 Exercise can help with dog behavior problems, and Beagles love to exercise and play. To keep a Beagle happy, you can go for long walks together as often as possible. Here are 10 Reasons Why You Should Exercise Your Beagle Daily. You can also rely on playtime to help wear him out and save him from possible boredom. Beagles love to play with kids, but you should only let them play when you are close enough to supervise. When all else fails, dog toys can also help keep your Beagle busy. Experts are unsure of the true history of the Beagle because the dog we know today is vastly different from his ancestors. Both Greeks and Romans spoke of Beagle-like dog in ancient texts. In fact, some experts believe the Romans brought Beagles over to England as rabbit-hunting dogs, and then the breed branched out from there. As lovable as your Beagle might be, no dog (or human) is perfect! There will be the occasional if not consistent behavioral problems. But don’t despair; all the negative Beagle temperament traits you see from day to day are correctable with proper Beagle training. If you have a hard time training your dog or don’t think you are up to the task then get a professional trainer. However, to get the best out of the Beagle, you will want to get involved in the training… some focused time and little patience are all it takes. For help with training your Beagle dog take a look at The Online Dog Trainer by Doggy Dan. Doggy Dan is an expert Dog Trainer based in New Zealand. His online resource contains Hundreds of Excellent Dog Training Videos that will take you step-by-step through the process of developing a healthy, happy well-behaved dog. Springtime is shedding time for the Beagle! He actually has a double coat that gets thicker in the winter. In addition to shedding season, though, Beagles tend to shed all year round. Brush him weekly to remove any loose hair and to promote the growth of healthy new hair, too. You don’t have to bathe him often unless he’s been rolling around the mud or garbage and is visibly dirty or stinky. And don’t forget to trim his nails often! As mentioned earlier, Beagles are very active dogs. You must exercise your Beagle for at least an hour every day. You don’t get off easy with the Beagle either. You can’t just open the door and let him run free. His history lends to his feeling happiest when he is with his pack; take his pack away, and he becomes bored and destructive. You may be able to prevent this if he has a friend to play with, either human or canine. Just be sure you have a secure fence at least five feet high. Beagles are amazing at escaping, including tunneling under fences. Because he has such a strong sniffer, always be sure to take him out on a leash. If he gets a good whiff of something, he won’t be able to resist, and he’ll be off like a shot. A normal weight for the Beagle is between 22 and 24 lbs. for a male, and between 20 and 22 lbs. for a female. A Beagle’s average height is between 14 and 16 inches for a male, and between 13 and 15 inches for a female. The Beagle's life expectancy is between 12 and 15 years. If you’re interested in adding a Beagle puppy to your family, first off, congratulations! Now, you’re probably wondering how to go about getting one of these dogs. Whom you buy from is up to you. You can find a Beagle for sale from a breeder, or you can adopt one from your local rescue organization. On average, a Beagle is going to cost you between $800 and $1,500. Any Beagle priced lower than $500 should raise a red flag, and any Beagle over $2,000 is more expensive than he needs to be. In either case, the breeder is trying to pull a fast one on you, so run, don’t walk, away. If you want to adopt a Beagle puppy, you may have better luck with a mixed breed. This is why, if you are open to a mixed breed, you should always let the shelter know. If you have your heart set on a purebred Beagle, though, and the shelter does not have one available, you can put yourself on a list. This way, when one comes into the shelter, you’re one of the first people they call. Adopting a pet is a wonderful thing because you get to give an animal a warm home who might otherwise never have found one. Animals typically end up in the shelter because their owners can no longer care for them. They are usually good dogs who just got dealt a bad hand. You can be that dog’s saving grace. Just keep in mind, though, that while adoption is significantly less expensive than buying from a breeder, this is only the price of the dog. If you can’t afford regular vet visits, obedience training, and all of the other things that go into properly caring for a pet, then you shouldn’t get one. If you’re looking for a good Beagle breeder, start with Old Reliable: the internet. The information you can gather from people who’ve used that breeder in the past is invaluable. Let’s face it: buying a dog from a breeder is not cheap. You certainly want to make sure that you’re giving your money to a reputable breeder, no matter how in love you fall with a particular puppy. You know you’ve found a breeder who cares when they don’t support puppy mills, and when they do whatever they can to make sure their dogs find “fur-ever homes.” This means that they train their dogs to be obedient and non-aggressive so that they have the best chance of living permanently in the home they end up in. Make sure the breeder provides a safe and clean environment for the puppies, and that you get all of the necessary health clearances before bringing that puppy home with you. Beagles are lovable, loyal and intelligent dogs, traits that all work in your favor when dealing with the Beagle temperament. To train your faithful friend properly, you will need to be able to dedicate effort, time and patience to the cause, but the rewards are more than worth it. Next post: French Bulldog Temperament – Do You Know What To Expect?